This weekend came at the perfect time. A breath of fresh air. Life had been feeling a little stale, a little overworked, a little exhausting. I wasn't feeling like my best me, but was I even striving for that? What was "the best me," exactly? Too often I find myself a prisoner of my own thoughts. I wanted to be everything - pretty, smart, athletic, popular, the list goes on. And slowly what started as innocent goals become something much more limiting. Maybe I was getting closer to these thoughts of perfection, but deep in my heart, I was still dissatisfied. It didn't feel like perfection. The tasks I was doing each day didn't feel inspiring or motivating. They felt like chores, like a to-do list to scrape through, barely hanging onto these ideals of what makes me my best. Friday was the breaking point, where I realized my best me isn't defined by these constructs. I've been striving for the wrong things, external - and I'm ashamed to admit, superficial - ideals of perfection. I had a chance to practice my new mindset this weekend, and already find myself in a place of contentment I had been missing all month. I laughed hard and played hard. If you're feeling less than your best, maybe your definition of best just needs a little update. There's rarely a savory recipe on Nommable, but when I got wind that the #virtualpumpkinparty was making it's second annual appearance, I knew I wanted this to be my contribution. It was one of those recipes I tested last year and never got around to developing, until now. First there's the pumpkin biscuit with all the good things in pumpkin spice - a little bit of cinnamon, a little bit of nutmeg, a hint of ginger. 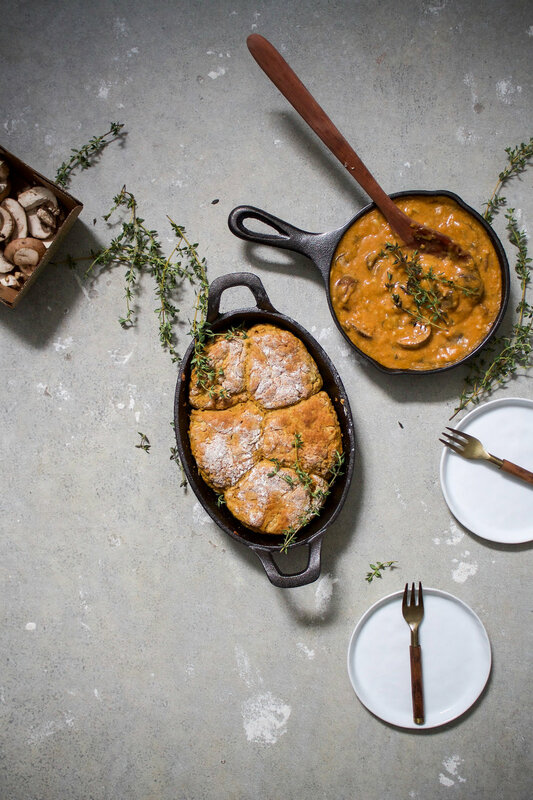 It's topped with gravy - salty to balance out the slight sweetness of the biscuit, herby from the thyme, and meaty from the mushrooms. Together the combination gives you the ultimate savory fall breakfast you've always wanted. Happy autumn, happy pumpkin-ing and apple-ing and whatever else you like to do to celebrate this beautiful time of the year! Preheat oven to 450 F. Butter a cast iron skillet and set aside. In a large bowl, whisk together the dry ingredients. In a medium bowl, whisk together the buttermilk and the pumpkin puree. Using a pastry blender or your fingers, quickly incorporate the butter cubes into the flour mixture until the butter is distributed throughout the flour mixture. It should look like little pebbles of butter in the mixture. Pour the wet ingredients into the flour-butter mixture and mix with a wooden spoon. You may need to add a little more buttermilk if it seems too dry, but try not to add too much - just enough so that the dough comes together. Pour the dough out onto a floured surface and pat into a mound that is 1 and 1/2 inch tall. 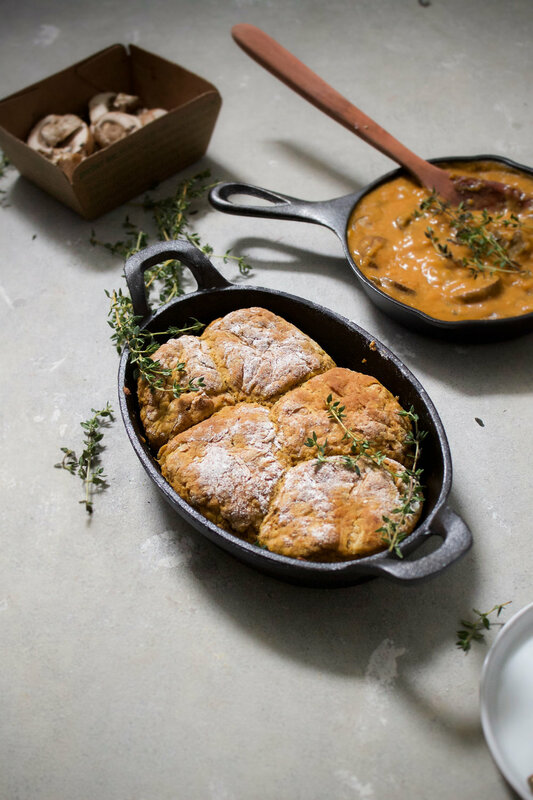 Cut out biscuits with a biscuit cutter and place each biscuit into the cast iron skillet so that they are touching on the sides. Place the skillet in the oven and bake for 12-14 minutes. Remove from the oven and let cool slightly before topping with gravy. For the gravy, heat 2 tablespoons of olive oil in a cast iron skillet on medium heat. Add the mushrooms and sautee for 5 minutes, then add the garlic and 1 tablespoon of olive oil. Cook for another 2 minutes. Add the fresh thyme and flour and continue to mix for 1 minute. Pour in the stock and bring the liquid to a simmer by turning up the heat on the burner. Allow the gravy to start simmering, then let it cook until the gravy begins to thicken, about 8 minutes. Add in the buttermilk, hot sauce, pumpkin puree and stir until well combined. Season with salt and pepper to taste, and allow it to continue to cook until it reaches the consistency of gravy you'd like. Enjoy the gravy on top of the biscuits, with a steaming mug of coffee and probably with a few friends who love savory breakfasts! Thank you Sara and Aimee, for hosting this not-so-little virtual party (over 100 entries in total!) and getting us all excited for the season. I have plenty of pumpkin on reserve for all the great recipes that will be up today. For the full list of pumpkin recipes, check out the links below.